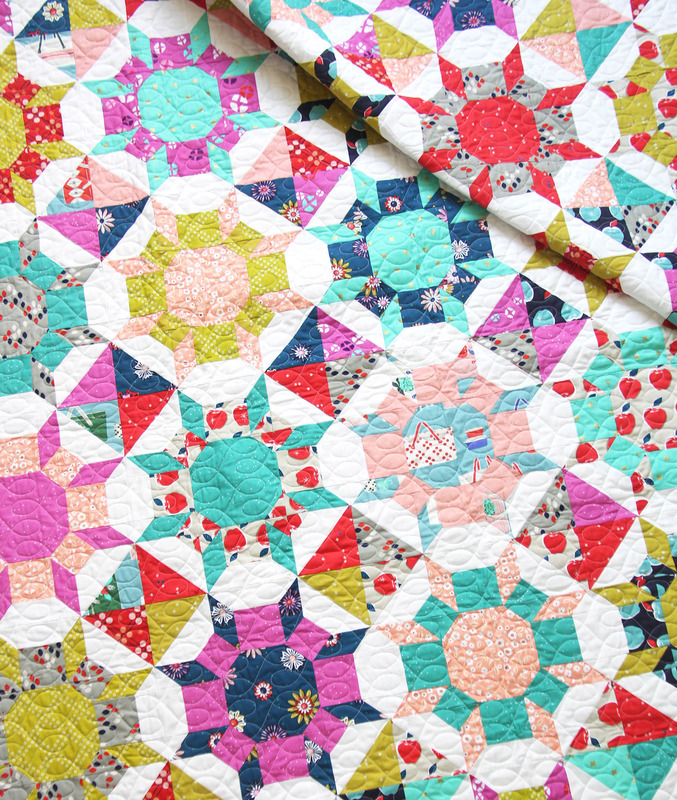 Grab those sunglasses….’cause this quilt is BRIGHT! It’s also my current favorite…which I say every time…but really, I love this one, brightness and all. 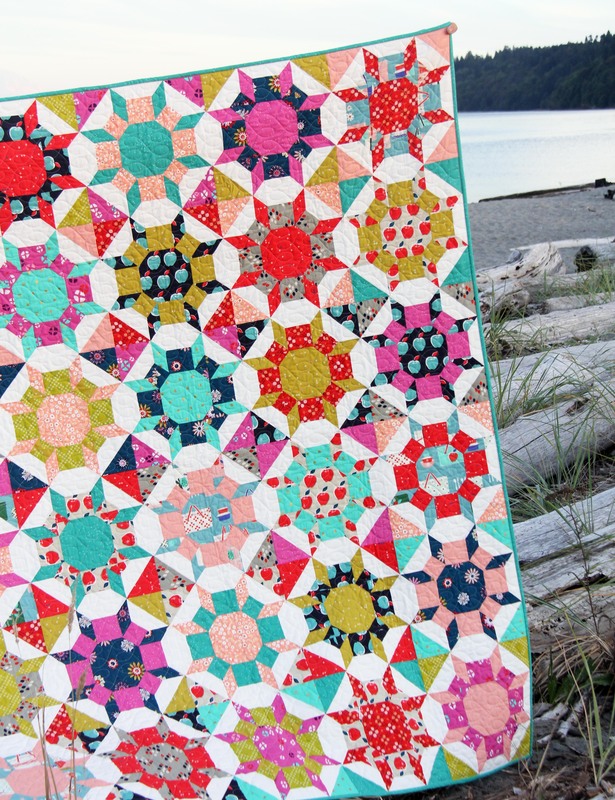 This quilt is a different version of Wallflowers, with smaller 14″ blocks and no sashing. I’ve wanted to make this version for years…right after I made the first. The block is a traditional Castle Wall block, which is normally English Paper Pieced, or is made with 5 templates and a lot of Y seams. This version has no Y seams (yay! ), no templates (double yay!) and is actually pretty easy to put together (another yay!) despite it looking kinda hard. All but maybe one fabric in this is Cotton and Steel, mostly from the new Picnic collection from Melody Miller, in stores now. Some of the prints are big…but pairing them with some near solids and less busy prints evens them out (a bit!). This one was quilted by Melissa with the modern twist pattern. The cover quilt is a Twin size (30 blocks) and the mock up above is Throw size (20 blocks). The pattern also includes a Baby size (9 blocks square) and a Queen and King size. 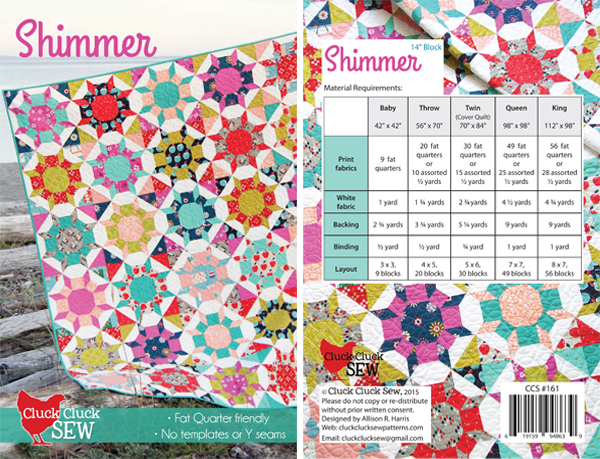 The pattern for Shimmer is in my shop, the PDF is available now and the paper will be here in a few days to send out. I’m sure going to miss these summer nights at the beach while the big boys fish. Thank you for your kind words about the Mini Quilts! It’s nerve wracking to put so much time into something and not know how it will be received…so thank you for your ongoing support and quilt love, it means the world! You have done it again. Another incredible pattern I have to add to my project board. I too see it in your HAZEL fabric.But Halloween would be spooktacular.Thank you for sharing your talent and quilting passion with all of us..
Oh man Terri….now all I can think about is making this in Halloween fabrics! Such a good idea!!! 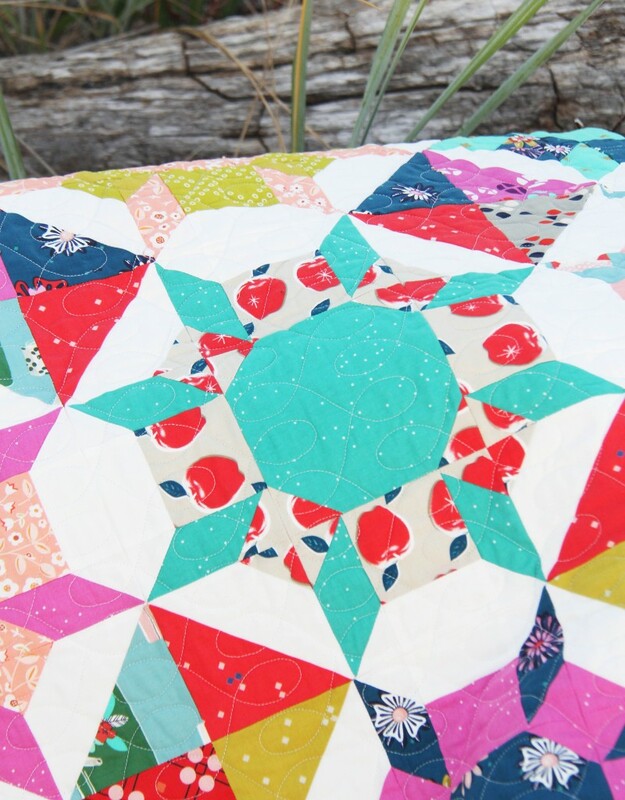 Love your style of quilting. I love how complex this quilt appears. The colors are amazing. what a great finish. I love the bright colors all together! 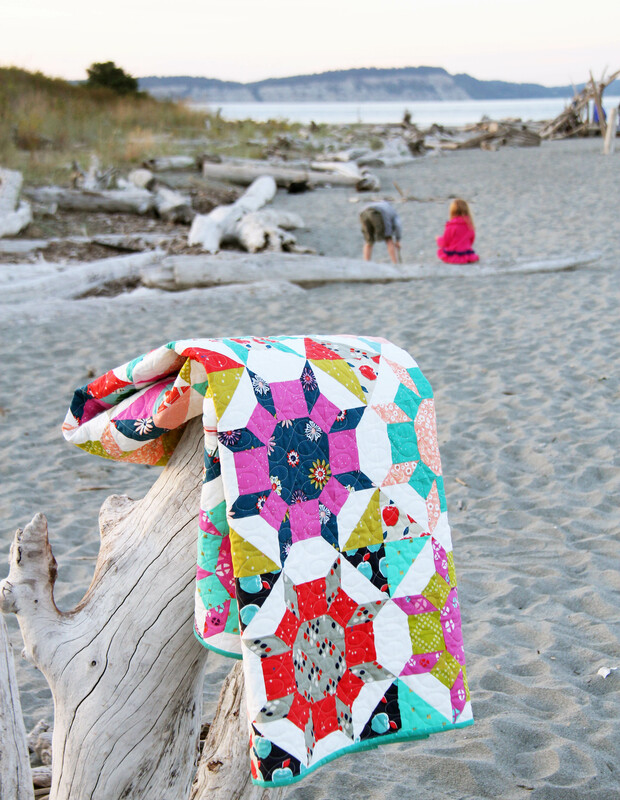 Love, Love Love this Quilt!!!!! This is drop dead gorgeous – love it! Great job! Funny how the next collection can sometimes look better than the last :-) Love the pattern!! Love the colors of the fabrics you selected and love the Shimmer design! Brilliant Allison! This is stunning! I’m going to need you to offer a bulk discount if you’re going to release a bunch of awesome patterns all at once! LOVE! Holy wow! As soon as I saw the pic I recognised that it was all,cotton and steel and it looks fabulous. Looks like you’re going to have to make another one! Lovely work. No Y? No templates? Must try it – and thanks for the mini tutorial on fabric combining. It works beautifully. My Wallflowers quilt is almost done but I love this one even better! Another fantastic pattern, and I know how to ale it now! Oh isn’t it gorgeous!! And I think you’re going to have to make one in Hazel too because it’s just too pretty not to! What a coincidence — this is MY favorite quilt now, too! :-) Love, love, LOVE it! 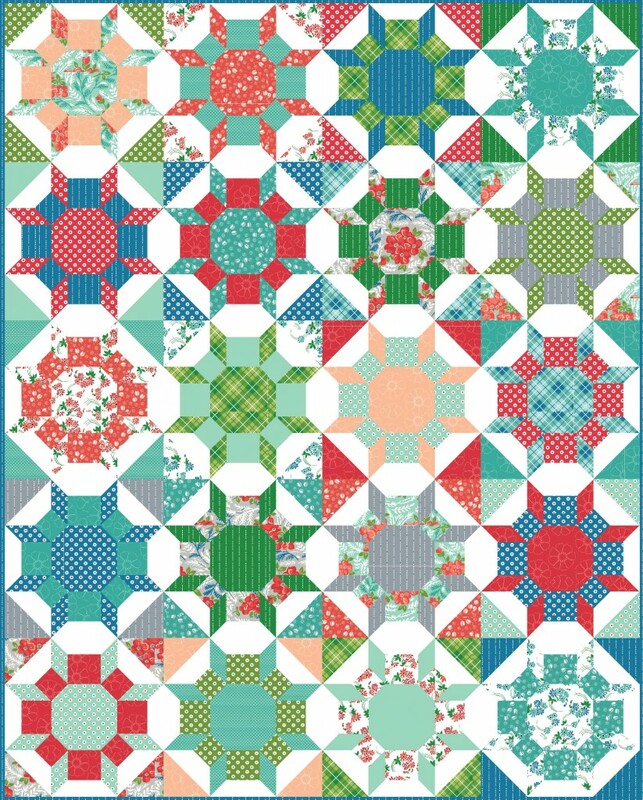 Great block, gorgeous happy fabrics, it makes me happy just looking at it. And I’m so intrigued that you did it without Y seams! Fat quarter shop needs to have both of these as quilt kits!!!!!!!! Do you have a list of the fabrics you used or is FQS going to sell this as a kit? Cindy I haven’t listed all the fabrics…but all but one of them are Cotton and Steel on the FQS or Hawthorne Threads website (you can look under all the CS fabrics). Most of the main prints of this are from the Picnic Collection for CS by Melody Miller. Thanks! Just added another quilt to my “one day” list! I’ll be watching Fat Quarter Shop for the kits. Can you please tell me how you made the Hazel mock-up? Did you use quilting software? Oh my gosh!!! I love, love, love this quilt! I had to comment before I rush to purchase it. Thanks! Thank you Candy! Happy quilting! I’m Jana from Germany and I spent the last 2 weeks reading your whole blog. It’s so bright, happy and inspirational, thank you!!! My next ‘new start’ (my UFOs are giving me the side-eye)–who knows when that will be–is going to be a Castle Wall done the *hard* way (I like hand piecing, good while watching TV). I love how you’ve broken the design down from something a lot of quilters would never attempt to something that is very do-able. That’s awesome, and the finished quilt looks great. Good for you Marla that’s awesome! I’d love to attempt a “real” castle wall someday too! I can’t thank you enough for posting a binding tutorial! Having the photos next to me ensured I would finally get the corners correctly sewn! 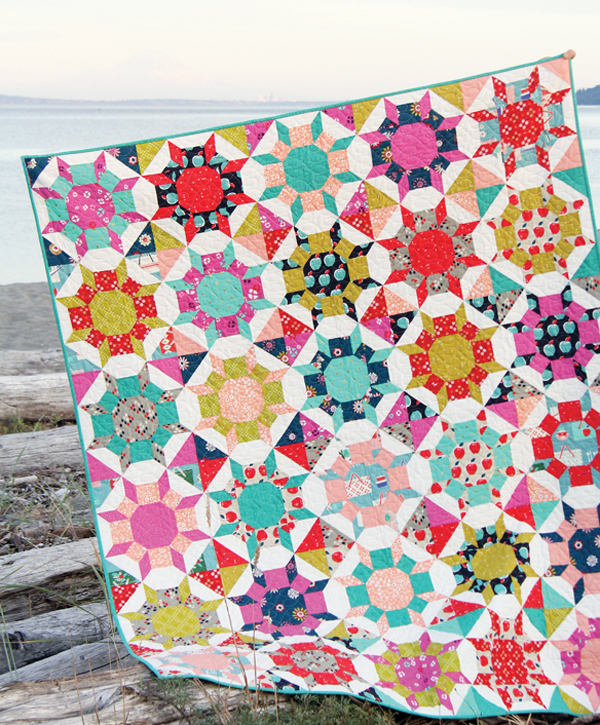 I’m making this quilt now, using all Kaffe Fassett fabrics. I’m afraid it might be too busy, with some “shimmers” a little less defined. No doubt it will be colorful!!! Is there a gallery of finished quilts somewhere? I’m thinking of doing this in blue and aqua batiks – hoping for a water like effect. So, I’m hoping to see something similar…. Thanks! I wish there was a gallery of this quilt! Try a shimmer quilt hashtag maybe on Instagram? I’m the worst at social media LOL.